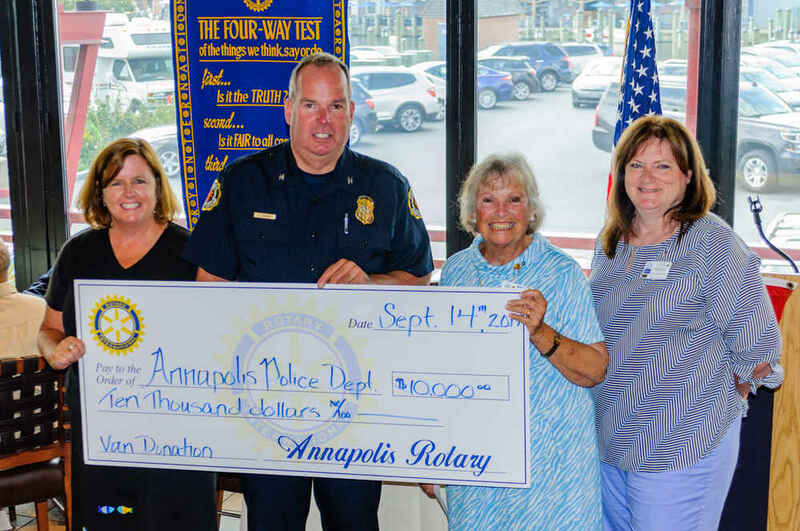 Annapolis, MD (Sept. 24, 2017) – The Rotary Club of Annapolis Foundation presents a $10,000 grant on Sept. 14, 2017, to the Annapolis Police Department for its “Van For Kids” community relations program. The van takes about 300 disadvantaged youth to camps, workshops and programs throughout the year. At the presentation are, from left, Patti Novis and Chief Scott Baker from the Annapolis Police Department, with Mimi Jones, chairman of the foundation committee, and Sue Weber, president of the Rotary Club of Annapolis. For information on the club and the foundation, visit the website http://www.annapolisrotary.org. For information on the “Van For Kids” program, contact the police department at 410-268-9000 or email police@annapolis.gov.